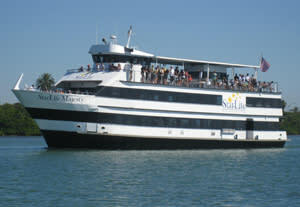 A Dining Cruise Delight at Starlite Dining Cruises! Hi everyone! Team YKPF (Ye Krewe of Palos de Fuego) headed out to Pinellas County and more specifically Clearwater Beach to visit StarLite Cruises. Laura Lothridge, the Director of Sales, was kind enough to meet us out there (and to be our photographer) to show us their Majesty, Calypso Queen and Nature Cruise boats. The Majesty is a modern style ship with a contemporary flair featuring brass and mirrored interior design. The vessel holds 180 guests for sit down meals and up to 400 for cocktail style events. The Majesty serves up lunch with sightseeing starting at $34.95 for adults and also has dinner and dancing cruises starting at $53.25 for adults. The Calypso Queen is StarLite’s colorful Caribbean themed ship which is more in tuned with a laid back atmosphere for those beach goers. The vessel holds up to 149 passengers for its afternoon lunch and dolphin viewing excursion or its sunset dinner and tropical cruise party; prices start at just $24.90 for the lunch and $34.90 for the dinner. Take advantage of these great Clearwater Beach experiences “for a dazzling night out”. That&apos;s it for now folks, but be sure to check out Starlite Dining Cruises and check back here for more updates and outings on things to do in Tampa Bay!